The TRIcrimp® crimping tool is designed and manufactured exclusively by Powerwerx to provide a positive crimp on the 15, 30 & 45 amp contacts manufactured by Anderson Power Products®. The TRIcrimp® crimping tool is not endorsed by Anderson Power Products®. Only official tooling solutions recommended by APP may be acceptable for safety agency approvals such as UL, CSA and TUV. 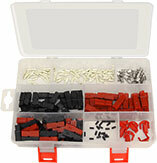 Official tooling solutions such as the 1309 series are available for purchase at a higher price. This TriCrimp tool is great value for the money. Equiped for 15/30/45 A and it’s easy to use with precise guidings. These make crimping the 45 terminals quick and painless! I wish I had purchased them a long time ago rather than using my Klein terminal cripers. Did a forum on PP's at last hamfest and ended up with a broken die for my trouble. Disappointed that the single 15-30-45 is not available from Powerwerx. Really, that "WOW" says it all. I was tired of fighting with fine-stranded 10ga and the 45amp powerpole contacts so I finally decided to try the TRIcrimp. It was 2x the price of similar non-powerpole specific crimpers, but I was tired of fighting and wanted a better solution. I found it. The TRIcrimp. I just put on two connectors, no muss, no fuss. I had been dreading that job because on the same wire last time it had taken multiple tries and literally more than an hour of frustration. It is too early to say how this tool will hold up. It seems well built (other than I prefer less plastic and more metal in handles) and I expect it will last me a good long time. Why was I so cheap? Why didn't I believe the other reviews? I bought this as well as the die collection over a year ago. This is one of the easiest tools for crimping I've used. It is very easy on my hand and I can get a great crimp from start to finish in one motion. Although this is a great tool for crimping powerpoles, lugs, and coax connectors (with the optional dies) the spring on the ratchet on my tool failed. I can still crimp, but the ratcheting mechanism is no longer functioning. This is a good tradeoff of more expensive tools, but it needs to be more durable. It should last many years, but it doesn't. Over the years I have collected a few crimpers so I decided not to buy this one in my first go around at my project. Had a little hard time getting things to come out right and finally bought it with my next batch of wiring stuff. I reworded everything just because this crimper is so great and my contacts are very reliable now. Definitely don't compromise - get this crimper. Easy to use and perfect crimp every time. Price is reasonable. I will get a lot of use out of this tool as I change over all my ham radio power connectors to Power Poles. Last week I began my adventure with the APP connectors. Crimped and soldered and had a lot of difficulty assembling the contact in the housing. Wasn't happy with the end result. Ordered this tool and had results today, smooth as butter. This tool is necessary and makes the job much easier. I highly recommend it to you! I started using powerpoles 6 years ago or more, and used a cheaper, more basic crimping tool to begin with because i didn't want to spend up on something more expensive. A couple of years ago i got this tool and kicked myself for not having bought it sooner. Does a great job on all my 15/30/45 amp power poles. I'm back here again after a while needing to order more powerpoles and stumbled across this and thought I'd recommend it. this is the best crimp tool I have ever used. the only thing I wish it came with a hand book showing what Die's are for each connector. each one is numbered so a list of what goes with what would be nice ! I would tape it to the inside of the storage box lid . I've been crimping connectors using all sorts of means. None of them resulted in a satisfactory or "professional" job. Ordered the optional dies to do coax connectors. You won't be disappointed. Yes, this crimper is every bit as good as everyone says. After soldering and plier crimping Power Pole connectors on an as-needed basis for years, I finally broke down and picked this up. As quickly as I could get the Power Pole connectors shipped to me, all mt 13.8V equipment sprouted new connectors. Fast and easy, effectively impossible to use wrong. However, once you buy this crimper, you'll want something better for all your crimping needs and will eventually come back and buy the die set and case. Save yourself the extra shipping and the $5 difference and just buy the TriCrimp Pro set now. You won't regret it. Have been using the crimper and die set in the ham shack and in the field for varoius ham activies as well as installing friends mobiles for a year and a half. In regular use this tool has held up well, it is easy to use changeing of the dies is not bad after some break in. Fists teh most common power connectors and many coax connectors for crimping. 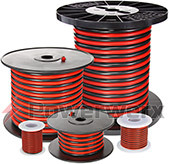 I recomend this if you are going to work with power and or coax cables. I was amazed at the quality of this crimper - I thought about whether I wanted to spend the extra money for this ratcheting crimper as compared to the less expensive pliers type. I usually am happiest when I get the best so I bought the better unit. The instant I opened the package I was sold - this is actually VERY inexpensive given its super heavy-duty construction. It will last a life time - it a professional-grade unit all the way. By the way, if you don't get the full set of extra jaws, buy the separate fitted case - it too is super nice. I am very happy with the purchase. I tried connecting the power poles without this tool with little success and much frustration. This tool is Precisely the tool for the job. If you are going to be making more than 1 or 2 connections, then you will greatly benefit from this tool! 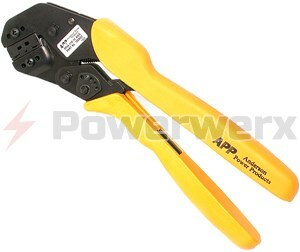 This tool provides excellent quality crimps of the power pole terminals at a great value price. A must have if you plan on using power poles. I've been soldering these Anderson Power pole connectors for years, (The company I worked for used them by the thousands, every month) I finally decided to buy the crimper from powerwerx. It's not as nice as the commercial duty crimpers at work, but these commercial duty crimpers are on the order of $1000 each. At my current use rate of several power pole terminals a week or so, this tool will likely last decades. After years of using Deans, EC3/EC5, hard-wiring, etc., I tried the no-solder solution with Anderson Powerpoles and I will never go back. No more lead, fumes, flux, or soldering irons. This crimp tool is a piece of cake to use and takes a fraction of the time that soldering does, and it's virtually fool-proof. I opened the box yesterday and converted 2 LiPo's, 2 ESCs, and my charger all over to powerpoles. It took less than 15 minutes and each crimp succeeded on the first attempt. Crimping creates a better mechanical AND a better electrical connection than soldering does, no matter how well you think you solder. I started using regular hand crimpers which was a disaster, then I started soldering all my Andersons, which isnt bad but takes time and is inconvenient in the field. I finally broke down and bought this crimper and Im still kicking myself in the rear for not doing it earlier. This crimper will make a very reliable and firm crimp along the full length of the wire insertion barrel. Just make sure to insert the pin so that it rolls into and digs into the stripped wire that was inserted. Great low resistance connection. Just add a little silicon grease when you're done and it is good to go almost anywhere. Im converting my whole operation over to Anderson connectors. Awesome tool, can't crimp improperly and excellent leverage. Strip wire, place crimp connector on end and insert into tool that has depth gage and crimp, that’s it. All that’s left is to snap into Power Pole and you’re done. Fool proof, great investment great tool great connectors. This tool works great. It puts perfect crimps on Powerpoles. It is easy to use and gives consistent crimps everytime. I used to solder all my connections but this tool does the job faster and better. One of the most important factors in crimping PowerPoles is ensuring that the crimp does not extend beyond the width of the contact blade. That's almost impossible to do consistently with standard crimpers. The TRIcrimp makes perfect crimps every time (regardless of contact amp rating) and makes PowerPole assembly almost a "no-brainer." If you assemble PowerPoles more than twice a year, you need this tool. When mine isn't on the bench working, it's in my "GO" kit along with a stock of housings and contacts, ready to deploy to any emergency. This product is the easiest I have ever used. It's built tough for indoor use and outdoor use. It came in handy at field day to fix a couple on p.p. As a broadcast engineer, I use a many crimp tools, and this is a quality tool, well worth the price. Soldering stranded wire, in effect, makes it a solid conductor, right where is flexes the most, making it likely to break. Crimping avoids this problem, and makes a reliable connection. No club should be without one. I just retrofitted all my DC Connections using Power Poles from 15 to 45. Its a real pleasure to be able to interchange equipment using this product as a standard. This tool is a "Must Have" in your toolbox. Just the tool for crimping the Anderson 15amp to 45 amp contacts. I have only made one bad crimp, that was the first one, forgot to read the instructions. All others since then have been perfect.